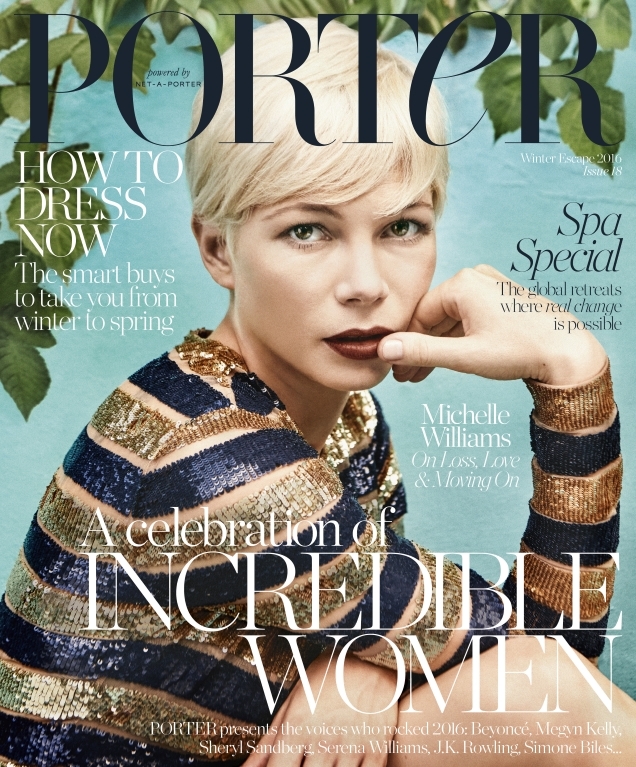 Our forums love it when a new issue of Porter is on the horizon, but we can’t remember the last time we felt this let down by a cover from the glossy. Sienna Miller‘s joyful May cover was exactly what we needed, but both Alicia Vikander and model Edita Vilkevicute have disappointed on recent issues. Sadly, the Winter Escape issue starring Michelle Williams isn’t enough to turn the trend around. Photographed by Porter staple Ryan McGinley, the actress wears a sequined Michael Kors striped dress while showing off her platinum blonde pixie hairstyle. Michelle’s cover was met with mixed reviews from our forum members. “She bores me to tears with this platinum pixie,” HeatherAnne ranted the moment the cover dropped. “I think she’s a very good actress, but her image per say is never interesting enough to entice me to buy a magazine with her on the cover, and certainly this won’t be the one that will make me change my mind,” Les_Sucettes added. Srdjan wasn’t feeling it either. “Jeez, will Porter ever make me buy (and keep) their magazine? I do usually like their editorial photography, but their covers are just not so worthy,” he shared. “This picture doesn’t do Michelle any favors. Also the colors are off, it’s too much,” Nymphaea described. But not everyone was unsatisfied. “Beautiful, nice to see Michelle on the cover,” admired zzzyao76 disagreeing with the majority. “When I read the title an excited smile appeared!! Just last night I watched Suite Francaise. So glad to see her on Porter,” exclaimed Benn98. “Its a beautiful cover image of her, she looks stunning, but I truly resent the ‘On Loss & Moving on’ tagline. How pathetic to keep putting her in that box! Almost, a decade later!” Miss Dalloway pointed out. How do you feel toward the cover, are you into it? See more and let us know here.